Do you have family or friends staying with you over the holidays? When they arrive with a fabulous hostess gift (hopefully!) you can greet them with a thoughtful gift of your own. Chances are they’ll be tired and cranky after traveling so it’s the perfect time for a little ‘anti-stress’ aromatherapy. With a spritz of lavender and chamomile – and maybe a glass of wine – everyone will be relaxed in no time! 1o drops chamomile essential oil . We used a “pillow blend” that had chamomile as wells as hops. Pour distilled water into a small spray bottle and add essential oil. Shake to combine. 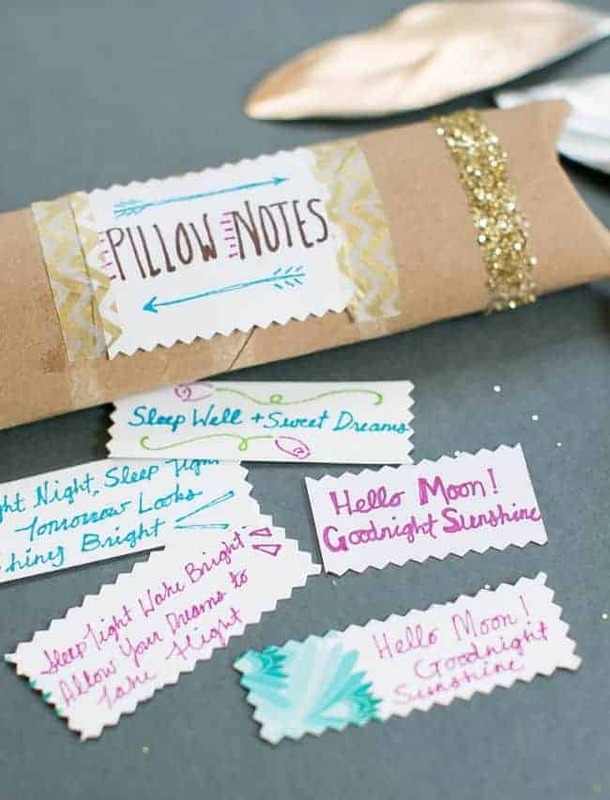 Cut various small shapes out of card stock and write little sleepy time notes to your loved ones with colorful markers. 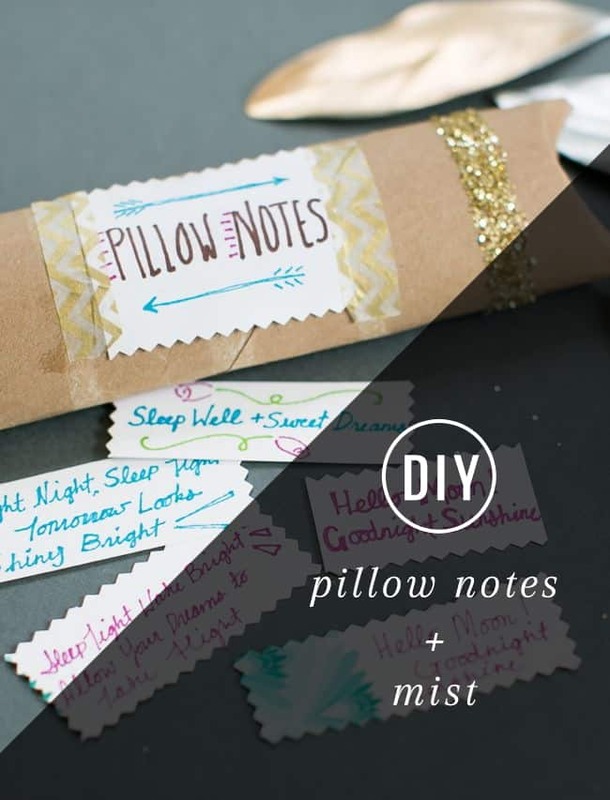 We took inspiration from these Anthropologie pillow notes. Cut a paper towel roll down in size a bit and put your goodies inside. You also add candy, lip balm and other goodies for your guests. Decorate the outside of the roll by putting double sided tape around the sections where the paper towels were attached. Then sprinkle with a little gold glitter. To close it up, just fold the ends of the paper towel roll onto each other, creating a crescent shape. I like to follow your site. I love these notes. 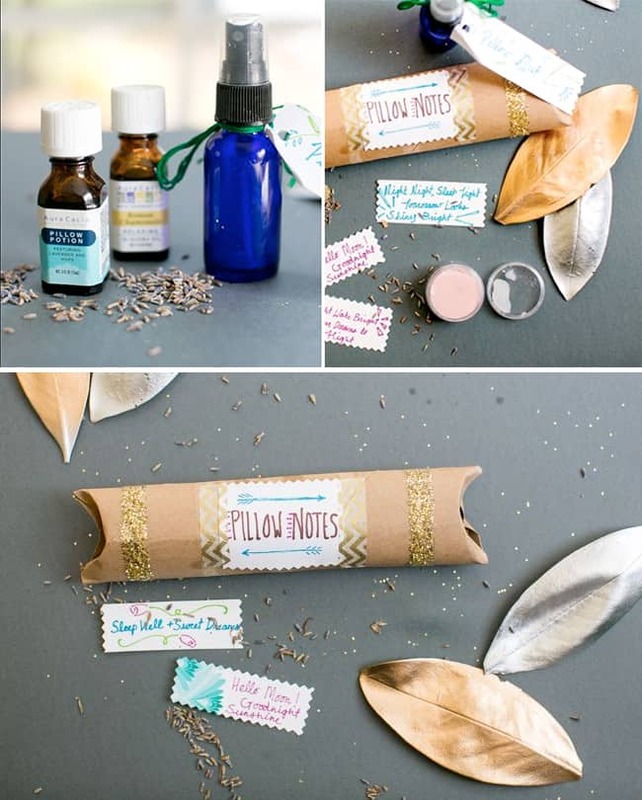 I love many of your ideas such as natural eyelash serum, and the lavender/chamomile scents for pillows etc but would like to know how to either pin it or copy it to my Facebook timeline so I can have it to make/use. Unfortunately I don’t see anyway dot do so, besides printing it. I don’t have a printer and would like to know how it would be possible to copy the information to make/ do / purchase any and all information for the projects. Please contact my email to inform me on any ways to do this. Darlene, are you serious..?! You can just bookmark it in your browser. I have a whole DYI folder with multiple categories within. Below the last picture you see above, with the sleep notes – can you see it? So, below that there are Social Media icons. Click on the “F” for Face Book and this page will be posted on your timeline.